The Things You Can Learn at the Library!! I like to read so one of the early things I do when I move to a new town is get a library card. McMinnville has some services I had not experienced in other places; for example, they email about events they are hosting. A couple of weeks ago I read that the Friends of the Library were sponsoring a program by Chef Eric Ferguson of Nick’s Italian Cafe and the Fino in Fondo salumeria here in McMinnville. 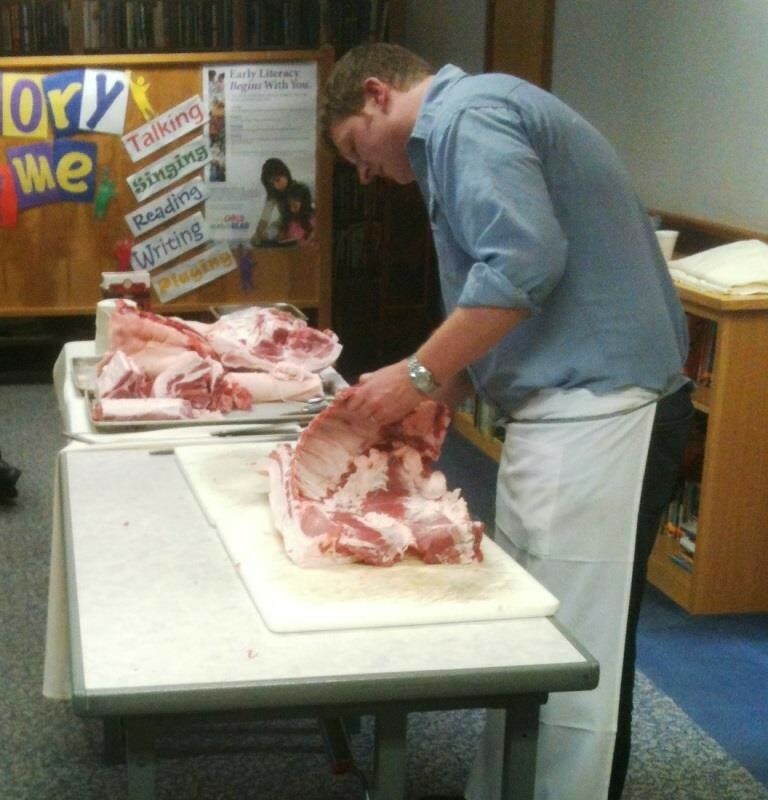 It was a repeat demonstration how to cut up half a hog. 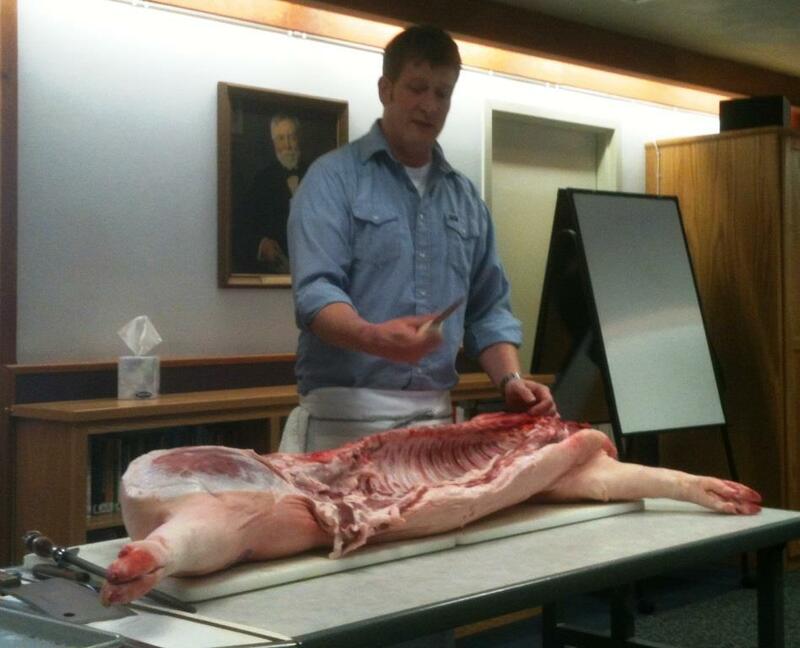 The demonstration started with a simple explanation of how to find locally grown hogs and how, with only a few tools, someone at home could reduce their per pound price of pork by learning how to butcher into desired cuts. And, as Eric mused, mistakes will be made and you will have more sausage than you expected. 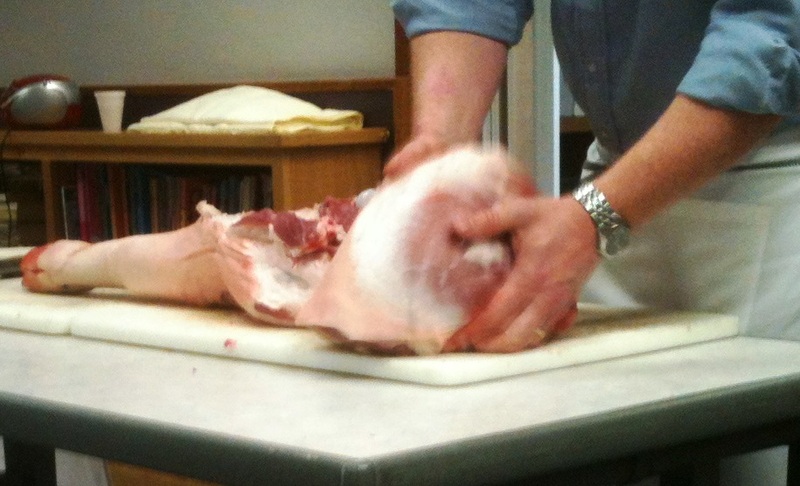 He first separated the half hog into three main pieces: the forequarter, the hind quarter and the mid section. After removing the more difficult pieces he then showed us how to break the midsection into spare ribs, loin, tenderloin, and bacon. Eric reminded us often about sharpening the knife and the proper grip. 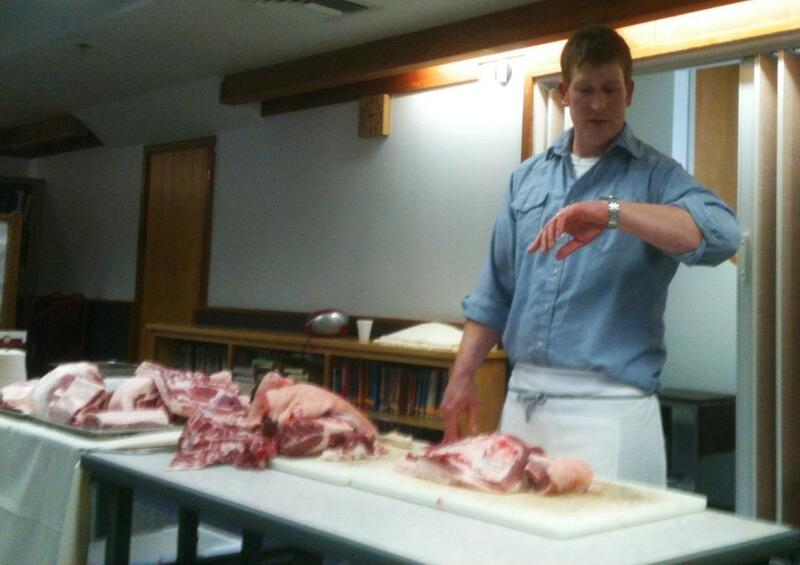 He also pointed out that the meat naturally has some separations and butchering along those lines helps to produce desired pieces like the ham. In all, even with slowed down demonstration and lecturing, Eric finished in about 45 minutes. He suggested that someone without his experience should set aside an afternoon to butcher and process the sausage. 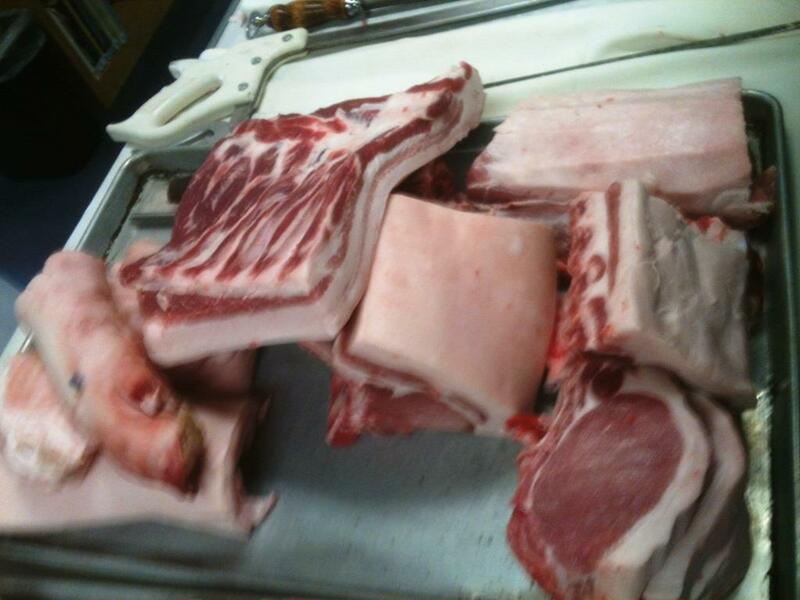 Nick’s receives a half a hog and a lamb weekly for the restaurant’s needs. 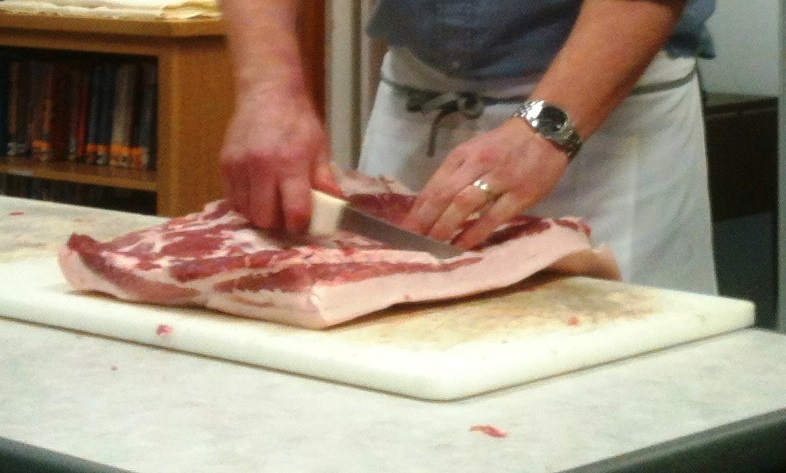 While you may not want to go to this extent to get your meat at reduced prices, you can order a bulk purchase like a half hog, lamb or part of a cow from Producers who also sell individual cuts through Yamhill Valley Grown. Buying your protein from a local farmer helps you know how the food you are eating was raised, that it is fresh and that you are helping the local economy by keeping your purchase of meat right here in the Yamhill Valley. All that and it tastes great too! This entry was posted in communication, community, consumer demand, education, local economy, Local food, local food stystem, pork, restaurant and tagged Chef Eric Ferguson, consumer interest', Fino in Fondo, library, local economy, local farms, Local Food, McMinnville, Nick's Italian Cafe, pork. Bookmark the permalink. 1 Response to The Things You Can Learn at the Library!! Seeing an article on Fido et Fondo was what McMinnville on our radar for possible places to live in Oregon. Their salamis are fantastic and I highly recommend them. We have eaten at Nick’s several times and recommend it as well. It has been a fixture on 3rd Street downtown since the 70s. They recently opened Perrone and Daughters, next to Nick’s which not only sells the salamis but a wide variety of local and imported (mostly Italian) food items and wines.